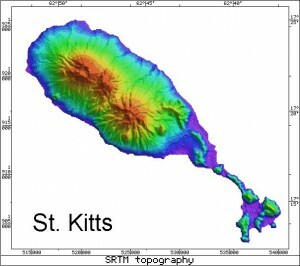 The island of St. Kitts (also St. Christopher), with an area of 177 km2 and a population of 36,000, comprises a chain of overlapping volcanic centers 28 km long and elongated NW-SE along the axis of the Active Arc of the Lesser Antilles. Baker (1969) described how volcanism migrated along the axis of the island with the centers becoming progressively younger towards the north west. The youngest and only active volcano is Mt. Liamugia (formerly Mt. Misery) which forms the north-west end of the island. Morphologically the island can be regarded as comprising four distinct components. Oldest is the Salt Pond Peninsula – a chain of eroded Pelean domes at the south-east end believed to have been active around 2.3 Ma (Baker, 1969) (Ma is a notation meaning million years). Also forming a component of this oldest part of the island are eroded remnants of other volcanic centers at Canada Hills and Conaree Hills on the south-east side of the island. 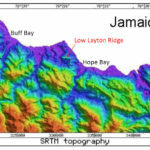 Little is known about the geology of these hills but this oldest part of the island is 16km long and a distinct and separate part from the three younger stratovolcanoes that comprise the bulk of St. Kitts island. 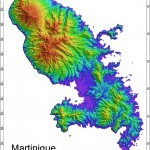 The middle part of the island comprises two tropical jungle covered eroded stratovolcanoes – the South East Range and the Middle Range – believed to be 1 to 2 million years old (Rex cited in Baker 1964). The stratovolcano of Mt Liamugia is believed to be less than 1 million years old. The Salt Pond Peninsula is a chain and cluster of at least nine eroded Pelean domes with remnant aprons of block and ash flow deposits. The domes rise to 319m. Around and between the cluster of dome remnants that make up the south-eastern end of the island and along the length of the oldest part of the island (up to Canada Hills) beach formation has resulted in the formation of eight shallow lagoons or salt ponds. The low topography of the Salt Pond Peninsula results in a low rainfall and the area has a semi-desert vegetation without the formation of tropical rain forest typical of the higher volcanoes on the rest of the island. The South East Range is a deeply eroded stratovolcano rising to 900m and comprising poorly exposed lava flows and volcaniclastic deposits. It has four peaks aligned NW-SE. There are two parasitic domes (Ottley’s dome and the Monkey Hill dome) situated on the southern and eastern flanks respectively. The island capital of Basseterre and the airport are situated on the southeastern flanks of the South-East Range. This large area of level ground lies partly between the South East Range and the remnants of the older volcanoes at Canada Hills and Conaree Hills. Morphologically only a half of the Canada Hills volcano remains as it is abruptly truncated on its south-west side. The Middle Range is another poorly-exposed, jungle-covered stratovolcano rising to 976m. It is morphologically separated from the South East Range yet is partly overlapped by Mt. Liamugia. There is a very small lake in a small summit crater. Baker (1963) described the volcano as being very similar to the South East Range volcano, but little is known about the center, although it is believed to be extinct. Mt. Liamugia is a basaltic to andesitic stratovolcano with an open crater (777m E-W by 1006m N-S) and several parasitic domes. 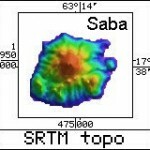 The stratovolcano has a SW-NE diameter of 5 km and rises to 1155m. The crater walls are 122m high on the west and 439m on the east and reveal that the superstructure comprises lava flows intercalated with coarse pyroclastic breccias. The peak of Mt. Liamugia appears to be a dome remnant. A pair of coalesced parasitic domes occur on the upper western flank of the volcano and Brimstone Hill is a third dome lying on the lower southwestern flank near the coast. The lower flanks of the stratovolcano are blanketed by a pyroclastic layer up to more than 40m thick named the Mansion Series by Baker (1963), comprising subaerial andesite layers with intercalated minor scoriaceous basaltic layers, that are mainly airfalls. The series shows much fluviatile reworking in many places. The series also blankets most of the island especially on the lower flanks of the volcanoes where it forms the fertile farmland. 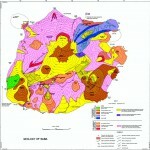 It has been eroded from the steeper upper slopes of the island (see Geological Map). Radiocarbon dating and detailed reconstructions of particular pyroclastic layers of the Mansion series from stratigraphic sections logged around the island (Roobol and others, 1981) showed that much of the succession is less than 40,000 years old and that the pyroclastic activity was of two kinds and composition controlled. For each pyroclastic layer three parameters were measured at each locality: thickness in cm (TH), the average maximum length of the five largest juvenile clasts (MJ) and the average maximum length of the five largest lithic clasts (ML). Subtle differences in colour, vesicularity and clast shapes were matched against a master set of clasts carried from outcrop to outcrop and the study was assisted by the identification of distinctive marker units. The resulting maps show that the dispersal axes of black basaltic scoriaceous fall deposits result from Strombolian activity that produced low pyroclastic eruption columns that drifted to the north west and west by Lower Tropospheric or Trade Winds (Figure. 1). In contrast green and brown andesitic fall deposits resulting from Sub-Plinian and Plinian activity had higher eruption columns because they were dispersed to the south east and east by Upper Tropospheric or Anti-Trade Winds (Figure 2). 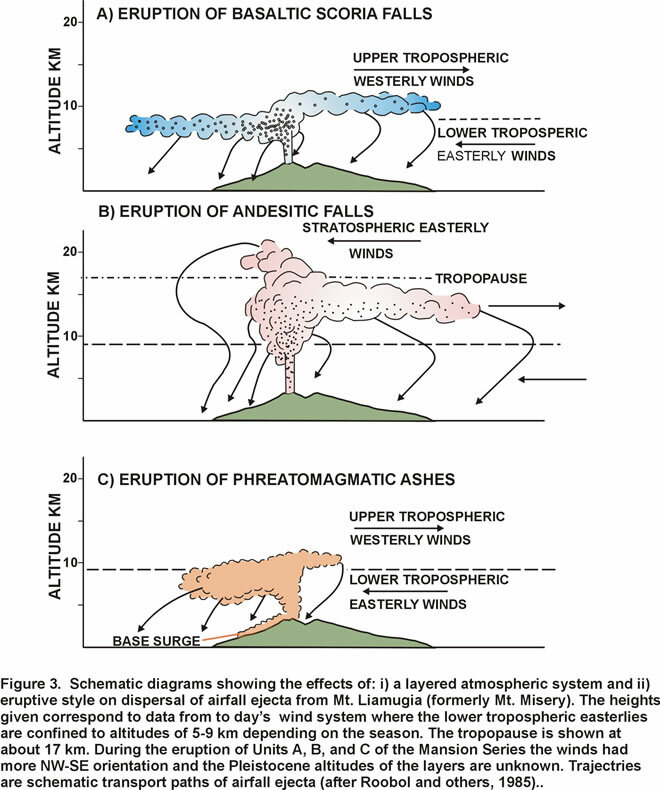 These contrasted styles of dispersal are summarized in a schematic diagram in Figure 3. The green andesite airfall layers of the Mansion series commonly contain microvesicular, subangular clasts due to some limited interaction of magma with external water that partly drove these eruption columns. The Mansion series contains carbonized wood (some standing in growth positions) for distances of up to 11km from the crater of Mt. Liamugia. Vegetation is thought to have been ignited by large juvenile ballistic bombs of dense green andesite measuring up to 15cm long at distances of 8km from the crater. Extensive pyroclastic flow deposits are well preserved on the north and west lower flanks of Mt. Liamugia and are well exposed in low sea cliffs. The deposits are both andesitic and basaltic andesitic resulting from dome forming Pelean and open-crater St. Vincentian style activity. In addition flow deposits of mixed magma scoria and ash flow types are also present. 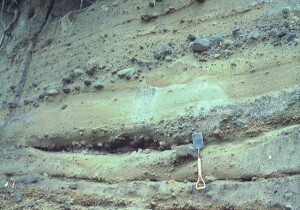 In these, the black scoria clasts contain flow bands of cream colored vesicular andesite. The alternations in eruptive style resulted in destruction of Pelean domes so that some of the scoriaceous pyroclastic flow deposits contain coarse grained layers of lithic lag breccias. The pyroclastic flow deposits were radiocarbon dated at 2,000 to 3,000 years B.P. The youngest deposits of Mt. Liamugia were named the Steel Dust Series by Baker (1963) and occur on the western flanks (Figure 4). They are a thin series of pyroclastic falls and base-surge deposits dated at around 1,650 years B.P. (Baker, 1983).